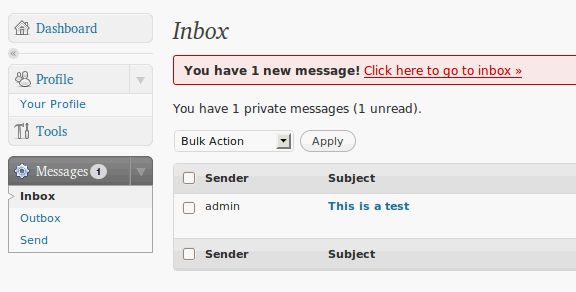 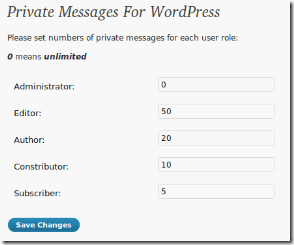 Home >> WordPress >> Wordpress Plugins >> Send Private Messages To Other Users In WP MU Setup From WP Dashboard Using Private Messages For WordPress Plugin. 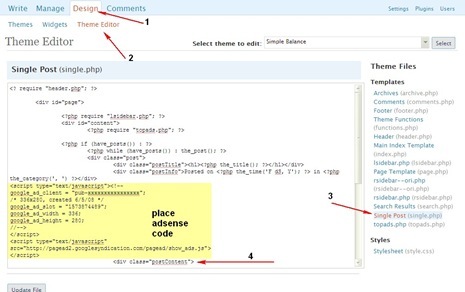 WordPress is defiantly the most popular blogging platform and the most important missing from a multi-user WordPress setup is the ability to send messages/communicate with registered users/authors.Private Messages For WordPress plugin can help fill this gap in WordPress and give users their very own inbox and outbox allowing registered users of the blog to send/receive private messages (PM) from others from the WP Dashboard similar to forums and direct messages(DM) in Twitter. 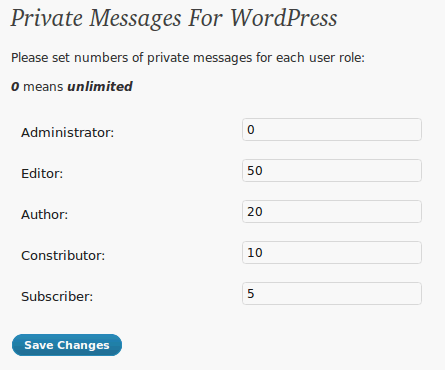 Set the number of PM for each user role in the plugin option page. 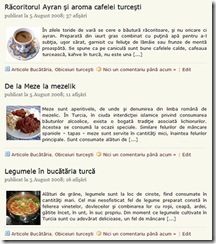 Set how to choose recipient: from dropdown list or auto suggest from user inputNote : Administrators of blog can control total numbers of items in mailbox of each user group (Administrator, Editor, Author, Constributor and Subscriber).A new menu “Messages” appears in the left.Select “Send” for sending PM or check the Inbox and Outbox for new/old PM’s.Download Private Messages For WordPress Plugin.